Started the first day in Burgundy with an early visit at Domaine Castagnier in Morey Saint Denis at 09:00 am. I found myself ringing the bell for couple of minutes without an answer and I was joined by a group of 3 Swiss guys that were scheduled for the same 9:00 am visit. Visit started shortly when the host arrived by car and invited all of us for a tour in the winery. It seems that Saint Moritz is a strong market for expensive Burgundy thanks to a large number of Russian tourists that come to ski. No surprise there. There are 2 separate labels here: one for wines produced from the vineyards owned labelled as Domaine Castagnier and another for the negoce business started only a few years ago labelled as SARL Jerome Castagnier produced from rented vineyards located in some of the most sought after appellations: Chevalier Montrachet, Corton-Charlemagne, Chambolle-Musigny 1er Cru Les Amoureueses, Echezeaux, Chambertin Clos de Beze, Bonnes Mares. We tasted only the 2015 vintage from barrels that shows impressive potential. 2015 is looking to be an excellent vintage for Burgundy, most of the wines just starting to finish the malolactic fermentation in barrels. They show structure, flesh and acidity in the right amounts to promise a long aging potential and complex aromatics. Tasted about 10 wines during the 2 h visit here but sadly lost my tasting notes for the properties visited on Day 1. From memory the wines tasted: Bourgogne, Morey Saint Denis 1er cru aux Cheseaux, Clos de la Roche Grand Cru, Clos Saint Denis Grand Cru, Clos de Vougeot Grand Cru, Gevrey Chambertin 1er cru Les Cazetiers, Mazy Chambertin Grand Cru. Second producer to visit after lunch was Domaine Chicotot in Nuits Saint Georges. Tasted some 2013’s and 2014’s here with high points for Nuits Saint Georges 1er Cru Les Vaucrains and Les Saint Georges 1er Cru. There is a big thing happening now in Burgundy as the vineyard Les Saint Georges is pushed to become the first Grand Cru of Nuits Saint George. It won’t happen over night but it is on everyone’s lips. Third producer was Bernard Rion in Vosne-Romanee where some of the highlights were the 1er Cru from Nuits Saint Georges and the Grand Cru’s. Last visit of the day and a highlight for this week in Burgundy was Domaine Meo-Camuzet. There are 2 labels here just like for Castagnier: one labelled as Domaine Meo-Camuzet that includes the wines from the owned vineyards, and one for negoce labelled as Meo-Camuzet Frere&Soeurs with rented holdings in many appellations. Tasted many 2014’s that show incredible consistency, purity and clarity, with lavish texture and silky smooth tannin, very well balanced by generous and complex fruit flavors. Starting from Hautes Cotes de Nuits, Saint Romain and going to Fixin Clos de Chapitre, Marsannay, Nuits Saint Georges Les Perrieres, Nuits Saint Georges Murges, Vosne Romanee Les Chaumes, Clos Vougeot and Echezeaux. These are all amazing wines that I would love to hold in my cellar. Finished the day with dinner at La Maison du Colombier in Beaune where I ordered a bottle of 2012 Meo Camuzet Hautes Cotes de Nuits just to keep lingering the memory of the wines tasted during the last visit. I took a short vacation and traveled to Beaune in Burgundy with the family from 18th to 22nd April. We had a lovely time together and I also had the chance to visit some top tier producers that I will expand more on the next following posts. There are a few words to say if you, dear reader and wine lover, consider visiting this city and wine region as a family with small children. My daughter is almost 3 so you would think she is fairly easy to integrate into a regular meal plan from any restaurant but the reality is completely different. Restaurants in Beaune are not child friendly and they usually have different service time then, at least, my daughter’s eating habits. For good restaurants the service time is 12:00 – 14:30 and 19:15 – 23:00. It’s like everybody is on vacation there, and I am not referring to tourists. The menu is usually strict and based on the day’s picks from the market according to what they say, which is fine. If it happens – as it almost always did for us – that their dishes and the kid’s taste fell in totally opposite directions, you might find yourself (I did) into a bit of a situation. So if your kid does not eat almost everything you should consider again a trip together in Beaune. There are some things to do while traveling with kids in Beaune: there is a beautiful park (Parc de la Bouzaise) that’s great to explore, the Center has many small streets to discover and plenty of houses with stairs. Stairs seems to be the new hit for us, each stair needs to be climbed over and over again. So what appears to be a short street, might take sometimes 30-40 minutes of walking, climbing and jumping from every stair. We stayed at Najeti Hotel De La Poste which sits on a great location, walking distance from the center where most of the restaurants are, fairly big rooms, very cozy and quiet. It is a very nice location to stay in Beaune. Ma Cuisine in Beaune. Tasty food and menu changes everyday. A good selection of wines by the glass and an extensive wine list. I had an impressive 2009 Domaine de Comtes Lafon Meursault by the glass (15 Eur) that surprised me with its perfect balance between stony and oyster shell minerality, honey and abundant sweet fruit, staying fresh, detailed and vibrant (94/100). La Maison du Colombier. This restaurant opens at 19:00 everyday and is closed on WED and SUN. The owner is a former chef from a 2 Michelin star restaurant and runs this place together with his wife. There is an impressive wine list here and there are plenty of gems at affordable prices to drink. Menu was the same for 2 days in a row and quite limited, but tasty. There is a good selection of tapas. Had a great wine there that I discovered the same day visiting the producer: Meo Camuzet Bourgogne Hautes-Cotes de Nuits Blanc 2012. This was such a lovely Chardonnay that shows plenty of tropical and stone fruits, with stony minerality, a ripe and fat palate with beautiful vibrant acidity and a finish that lingers (92/100). 55 Eur per bottle on the restaurant list and great discovery for me. if you have a car – which you should have if you want to visit wineries, I would recommend to dine at Au Clos Napoleon in Fixin. Book a table in advance on the terrace because the place gets crowded quickly. When the weather is sunny outside, the view over the vines makes it for a very enjoyable lunch. Food is also good. Another good location for food is in Morey Saint Denis, the restaurant from Castel de Tres Girard. There is a long and interesting wine list, filled with plenty of great wines and grower’s Champagne at good prices. I had a 2011 Clos des Lambrays from Magnum and a 2012 Puligny Montrachet 1er Cru Domaine des Lambrays that were stunning. It was also my daughter’s first visit to a winery and I believe she starts on a good ground. I will have a few separate posts the following days about the wineries I visited and the wines I tasted – mostly 2014’s, with some unexpected surprises, as my schedule was pretty full with about 3-4 wineries a day. It was nevertheless a great time visiting this beautiful and calm region with the family. Other highlights of this trip were meeting Mr Steven Spurrier 2 times over 2 days at the same wineries I was visiting – what were the odds, and practicing my modest French during these visits as English is not such an international language in many cases here as one might believe. If you want to discover and order some wines from Burgundy I would suggest visiting real-wineboutique page. Last year I spent a whole week in Bordeaux between September 29th and October the 2nd. Every day I visited 4-5 wineries and I ended the week with a very special and unusual dinner organized by Olivier Bernard and his wife, the owners of Domaine de Chevalier from Pessac-Leognan and several other properties in Bordeaux, at their residence which coincides to be the actual winery of Domaine de Chevalier. I was told in advance by the person who invited me there, how things would go: there are no more than 10-11 people that attend, mainly wine critics and people from the wine business, and the event happens only once per year. The uniqueness of this dinner is that, Olivier Bernard chooses and serves all wines blind, only the very first wine is shown what it is. From that moment on, all wines served should have only one thing in common: the last digit of the first wine’s vintage will remain the same for the whole line-up of wines. Otherwise, sky is the limit in terms of region, appellations, countries of origin and span of the vintages. Before dinner there was obviously a pre tasting of different wines (about 15-20) made by Olivier in several appellations of Bordeaux and a visit of the whole Domaine de Chevalier winery. I noticed the most unusual one single barrel of fermenting juice and grapes made by Domaine de la Solitude (same ownership) from a tiny, very old parcel of 200 years old vines that has a life and reputation of its own. 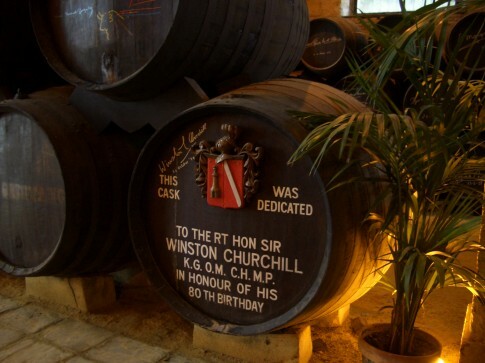 Only 1 single barrel made of this very special wine. From this moment on, we were on thin ice. Olivier takes great joy from putting wine specialists and people from the trade into hot seats. I’m saying this in the most candid possible way as I have great sympathy and respect for this Gentleman. 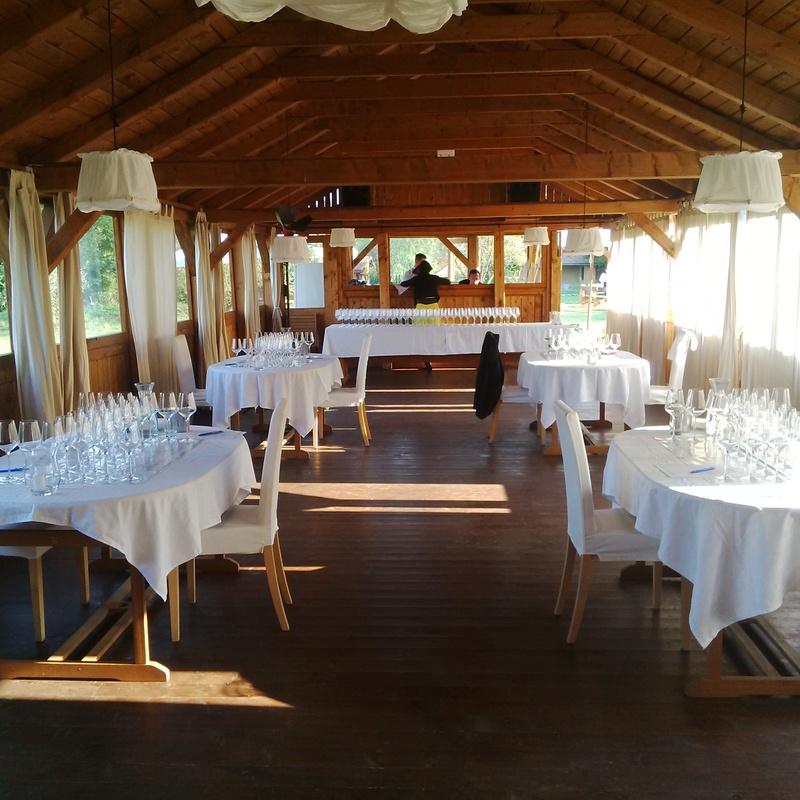 We took our seats at the impeccably arranged table in a separate room and first flight of wines was served: two whites, similar color, completely different aromatic profiles. One was vivid and reminded of a well aged Riesling with a very clean nose of stone fruit, the other showed a more pronounced aging, a citrus dominated nose and not as clean or generous. The American negociant nailed what I believed to be a Riesling: it was a superb 1985 Puligny-Montrachet from Domaine Leflaive, a time when Domaine Leflaive was the pioneer of quality in white Burgundy. Outstanding quality at that village level. Second was Domaine de Chevalier Blanc 1985, still alive but more of an aged man. First red wine of the night was a first for me. The oldest wine I have ever tasted. Its color was not showing it, because there was still some medium ruby red next to the brick rim, while the nose was full of tertiary aromas. On the palate there was just a tiny, discreet pale of some dried red currant. Not necessarily something that you would enjoy as a whole bottle, but for what it was, it transcended time: 1925 Chateau Cos d’Estournel. It is not a wine I would recommend for acquisition, but if you would get the chance to find it at a good price, you should try it. Of course, it is more of a gamble as provenance is crucial, so if you feel adventurous follow your urge. The second red served of the same flight showed a more intense presence of red fruit, but somehow didn’t seem to hold much better that the 1925. The 1955 Chateau Grand Puy Lacoste was not the wine that other people reminded to be from other tastings as I was told. At this point nobody had any clues about these two wines. New flight consisted of three wines and had several things in common, but for us being offered blind the most important was the vintage. As a start. Then came the origin and the actual wine producer itself. Now I have to confess that I take great pride in being able to surprise the audience and, more importantly, the host the this lovely dinner that started to see me with different eyes from that moment on, when I nailed the best wine of the flight and probably the red of the dinner. I do have to share with you the circumstances of this impressive – even for me – achievement. The first thing that I noticed was the color: having a 1955 before and knowing that 1965 was not a good vintage in Bordeaux – well I knew these wines were Bordeaux from their nose – I saw that based on the color and intensity of nose it was older than a 1985, and knowing we have only 5 ending vintage wines, it has to be a 1975. I got that confirmation from Olivier. We eliminated the Right Bank as the originating appellations. So we were left with the Left Bank. Now there are several outstanding wines made in 1975 and we took out Pauillac as being one of the appellation of these wines. So the fact that I had some Leoville Las Cases several times in the past, gave me the upper hand to make a good impression for Romania: nailed the 1975 Chateau Leoville Las Cases. That felt good indeed. 1975 Chateau Leoville Las Cases is just a great wine. Still going strong on red fruit, it has cedar and pencil shavings freshness, very smooth and appealing on the palate. The other two wines were 1975 Domaine de Chevalier Rouge – it was the vintage when Olivier Bernard took over Domaine de Chevalier and it was the last vintage produced by the previous manager – and 1975 Chateau Cos d’Estournel. Cos d’Estournel showed more intensity and grip, while the Chevalier Rouge was just a pale shadow of once good wine. Dessert came paired with two sweet wines. I did guess the vintage but not the appellation, nor the producers. Chateau Guiraud 1975 and 1975 Chateau Gilette ‘Creme de Tete’ – I said Barsac but they were both from Sauternes – were both nice, but Guiraud showed a fresher vibrant acidity and cleaner defined sweet caramel, saffron, orange and quince marmalade aromas. It was simply delicious. This was an absolutely unique experience where everybody paid really close attention to wine for the whole dinner and the stirred discussions were the best case study you can do into the history of Bordeaux. We were extremely fortunate to experience all these great wines because history shows that most successful vintages in Bordeaux ended in a 5. Rumor is this year’s dinner will be all about 6. M-am intors recent de la Valea Verde (Cund) unde s-a desfasurat jurizarea vinurilor alese de catre Marinela Ardelean pentru a fi incluse in The Wine Book of Romania, carte ce va apare pana la sfarsitul anului curent, si dupa cateva zile de odihna ma simt dator sa impartasesc cateva impresii despre acest eveniment. In primul rand alegerea locatiei mi s-a parut extrem de inspirata, fapt indelung confirmat si de catre ceilalti membri ai juriului cu participari mult mai numeroase la alte concursuri internationale. Se pare ca si in cazul lor a fost one of a kind experience. Lipsa completa a semnalului la telefon, prezent doar in incinta restaurantului unde se servea micul-dejun si cina, cred ca a fost de bun augur, filtrand orice posibile interferente din exterior. 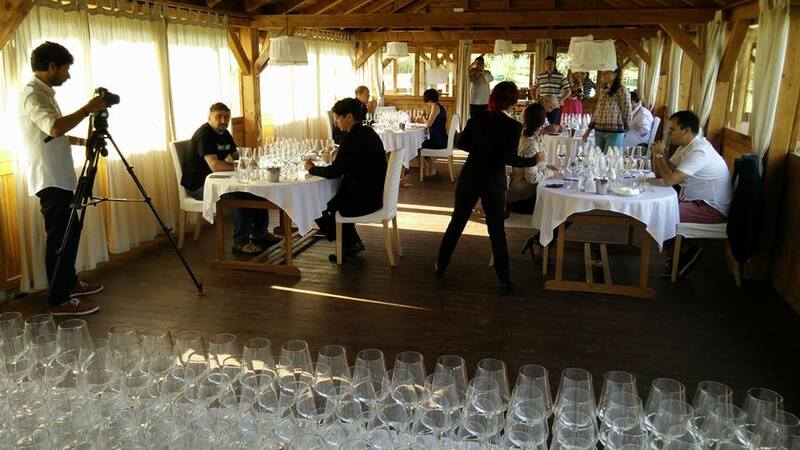 Organizarea intregului eveniment a fost ireprosabila, iar cei trei somelieri: Bogdan, Marius si Anda, care s-au ocupat de pregatirea a peste 250 de sticle de vin si a sute de pahare merita toate laudele. In ciuda caldurii de afara vinurile au fost servite la temperatura optima in cele 2 zile de concurs. fiecare jurat a degustat 190 de vinuri in cele 2 zile de concurs. degustarea s-a desfasurat in fiecare zi dintre cele 2 de concurs (26, 27 August 2015) in doua sesiuni: dimineata de la 9:00 la 14:30 si dupa masa de la 18:30 la 20:30, un maraton avand in vedere ca fiecare vin a fost degustat si discutat in comisii si intre toti cei 8 membri. in total in evaluare au intrat aproape 250 de vinuri. vinurile au fost servite toate in orb (blind) pe diferite categorii: albe autohtone, internationale, cupaje, roze, rosii autohtone, internationale, cupaje, vinuri dulci, spumante, etc. Rezultatele nu au fost comunicate nici membrilor juriului nici macar la final. Cartea va fi o surpriza pentru toata lumea. singurele informatii comunicate despre fiecare vin au fost anul de recolta si soiurile (autohton sau international). notarea vinurilor a urmarit sa puna intr-o anumita categorie fiecare vin, mai mult decat sa acorde o nota fixa. Astfel 3 stele reprezinta intervalul 80-84/100, 4 stele intervalul 85-89/100 si 5 stele vinuri de peste 90 de puncte. Jurizarea s-a facut pe comisii care au alternat intre echipe de cate 2 sau 4 membri. 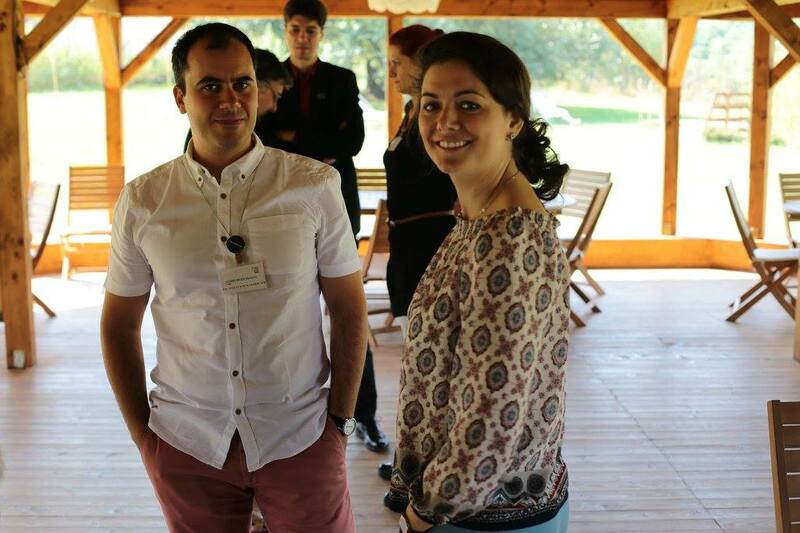 Toate soiurile autohtone au fost degustate si comentate de catre toti membrii juriului, in timp ce la soiurile internationale degustarea si comentarea lor s-a facut in comisii de cate 4 membri formate din 2 echipe de cate 2 jurati. echipe de cate 2 jurati asezati la aceeasi masa au degustat aceleasi vinuri servite tuturor celor 8 membri. fiecare echipa a produs un rezultat final partial notat intre 3 si 5 stele sau descalificat (cand era cazul). fiecare echipa si-a ales un reprezentant care sa discute cu reprezentantii celorlalte 3 echipe nota acordata fiecarui vin. In cazul in care punctajele acordate fiecarui vin nu erau la fel pentru toate cele 4 echipe, aveau loc discutii pentru a clarifica care aspecte ale acelui vin au fost apreciate sau depunctate de catre echipe. In baza unui acord general se stabilea nota finala. vinurile care au fost eliminate au fost reintroduse in concurs in ultima sesiune de degustare de joi seara pentru a se constata consecventa notei initiale. intregul eveniment inclusiv sesiunile de degustare si discutiile au fost filmate in intregime si vor apare in cadrul unui documentar TV. In cazul soiurilor internationale s-a procedat in acelasi mod la notarea vinurilor, diferenta fiind ca nu toti membrii juriului au degustat toate vinurile. Comisii de cate 4 membrii impartiti in 2 echipe de cate 2 persoane au urmarit aceeasi pasi mentionati mai sus. Partea interesanta este ca la fiecare serie de vinuri se schimbau membrii echipelor, astfel incat fiecare jurat a putut degusta cu toti ceilalti 7 colegi de cel putin 3-4 ori in cursul celor 2 zile. Fiecare serie continea intre 6 si 12 vinuri, cu pauze de 5-10 minute intre serii, timp in care se schimbau toate paharele cu unele noi si vinurile noi erau turnate de catre somelieri. Ceea ce m-a surprins extrem de placut este ca juratii straini au recunoscut o parte din strugurii autohtoni: Novac, Negru de Dragasani, Feteasca Neagra, Feteasca Regala, etc. Ce este cert este insa ca unanim au constatat evolutia calitatii vinurilor produse in Romania. Mi-a placut initiativa Marinelei care a solicitat ca fiecare membru al juriului sa-si aleaga un vin care l-a marcat/impresionat in mod deosebit si despre care sa scrie propria nota de degustare care va apare de asemenea in aceasta carte. Mentionez ca nici in acest caz nu s-a comunicat numele vinului sau al producatorului. A fost o experienta deosebita pentru ca am putut degusta si comenta vinurile alaturi de o echipa de specialisti internationali. Am apreciat fiecare moment petrecut in compania fiecarui jurat si cred ca aceste discutii au avut o valoare la fel, poate chiar mai insemnata decat nota in sine, cel putin pentru mine ca membru al juriului. 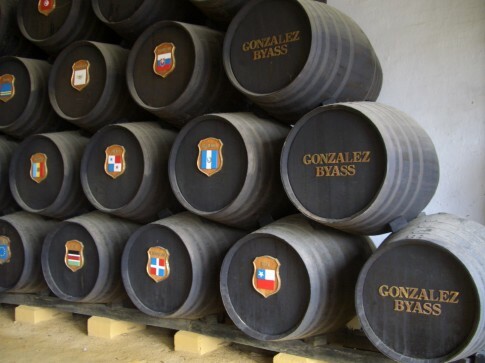 Sherry este denumirea generala a vinurilor fortifiate produse din struguri albi in zona orasului Jerez de la Frontera din Andalucia, in sud-vestul Spaniei. Subevaluate pentru o perioada lunga de timp, aceste vinuri incep sa-si recas- tige prestigiul de care s-au bucurat la inceputul secolului al 16-lea, cand cantitati impresionante de Sherry erau trimise catre America, Marea Britanie si Olanda. Doar in anii 1950 s-a egalat aceasta cantitate. Sherry este denumirea englezeasca a cuvantului Jerez, in timp ce francezii il stiu ca Xeres. In regiunea Jerez DO sunt cunoscute trei centre principale de maturare a Sherry-ului: Jerez de la Frontera, Sanlucar de Barrameda si Puerto de Santa Maria, fiecare impregnand vinului propriile subtilitati. Exista doua tipuri principale de Sherry: dry fino – un vin fortifiat sec, galben pal, care se matureaza sub influenta unor particule fine de drojdie denumite flor, si oloroso (un vin fortifiat inchis la culoare, cu o corpolenta plina). Toate stilurile (in ordine crescatoare dupa corpolenta) Manzanilla, Fino, Amontillado, Oloroso, Pale Cream, Cream etc. sunt variatii ale celor doua tipuri principale. Exceptia o reprezinta Palo Cortado, un stil intermediar aparut natural, intre Amontillado si Oloroso. In secolul al 19-lea, se producea Sherry din mai multe soiuri de struguri, dar dupa ce filoxera a distrus mare parte din vite in anii 1890, multe au disparut. Acum, Sherry se produce strict din: Palomino, este cel mai usor de cultivat si cel mai reprezentativ – in jur de 95% din intregul DO, Pedro Ximenez (PX) – in jur de 100 ha cultivate in total, si Muscat de Alexandria – in jur de 3%, soi plantat in zonele mai nisipoase si utilizat la indulcirea celorlalte vinuri. Vinul Sherry este produs prin adaugarea de distilat din struguri peste vinuri linistite pe baza de Palomino, ce au un grad alcoolic iniţial de 11 sau 12%. 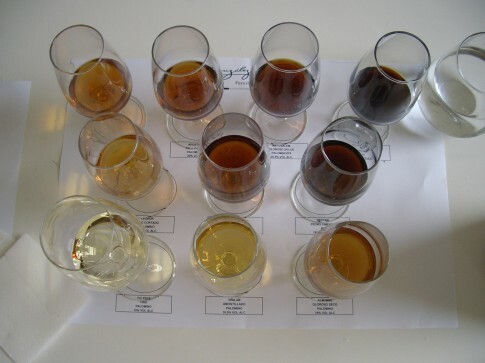 In funcţie de cantitatea de distilat adaugat, sherry-ul poate ajunge la un nivel alcoolic de la 15-15.5% pana la 22%. Drojdiile flor cresc la suprafaţa vinului, apariţia fiind determinata de nivelul alcoolului. Creşterea şi raspandirea lor este oprita de o concentraţie alcoolica mai mare de 16%. Vinurile care sunt destinate sa devina fino sunt fortifiate pana la maxim 15.5%, iar cele pentru oloroso, ce se matureaza fara flor, in jur de 18%. Flor creşte natural la suprafaţa vinului, iar butoaiele de fino sunt umplute la 5/6 din capacitatea lor, deoarece aceste drojdii, care protejeaza vinul de oxidare, au nevoie atat de alcool, cat şi de oxigen, fiind sensibile la caldura. Flor se dezvolta mai bine in zonele racoroase şi umede de pe coasta, in jurul oraşelor Sanlucar de Barrameda şi Puerto de Santa Maria, faţa de cramele din oraşul Jerez de la Frontera. De aici subtilitaţile fiecarui vin din cele trei zone diferite. Drojdiile flor sunt menţinute in viaţa timp de şase ani prin adaugarea de vin tanar in butoaie. Aceasta este baza sistemului Solera, prin care nu doar se pastreaza drojdiile vii, dar se şi asigura consecvenţa stilului. Pana la 33% din conţinutul butoaielor poate fi retras anual şi inlocuit cu vinuri din alte butoaie. Vinurile care au pierdut pelicula acoperitoare de flor capata o culoare inchisa, ca a chihlimbarului, işi schimba caracterul datorita contactului cu aerul şi sunt cunoscute ca amontillado. Sunt de obicei seci şi pot evolua şi matura timp indelungat in sistemul solera. Sherry-ul oloroso, fortifiat pana la 18% alc., evolueaza fara ajutorul drojdiilor flor, avand contact mai mare cu aerul. Vinurile devin maronii inchise, caştigand in concentraţie, iar nivelul alcoolului creşte de asemenea in timp datorita evaporarii lichidului. Un nivel al alcoolului de 24% este comun in cazul unor oloroso mai vechi. Acestea pot fi seci in mod natural sau dulci prin adaos de vin sau sirop concentrat dulce din struguri PX, ambele stiluri avand o corpolenţa plina. La inceputul lui aprilie 2012, am vizitat cramele Gonzalez Byass din Jerez de la Frontera. Acest producator a inceput sa comercializeze vinuri fortifiate in 1835. Crama, o cladire metalica realizata de insuşi constructorul turnului Eiffel, gazduieşte un numar impresionant de butoaie, ce poarta steagul fiecarei ţari in care sunt exportate vinurile producatorului. Printre numeroasele butoaie purtand semnaturile unor persoane celebre: de la familia regala spaniola la regizorul Steven Spielberg, Vicky Gonzalez a menţionat povestea vizitei economistului Milton Friedman, care nu doar şi-a lasat semnatura pe unul dintre butoaie, dar a şi calculat ca fiecare dintre butoaiele din sistemul solera conţine pana la 50 de vinuri din ani diferiţi. Dupa vizita cramei, am fost invitat de Vicky Gonzalez, membra a familiei proprietare, sa particip la o degustare privata, unde am putut testa 10 tipuri diferite de sherry, 2 de brandy, dar şi un cupaj de Syrah şi Cabernet Sauvignon din zona Cadiz. M-au impresionat Apostoles Palo Cortado (Palomino/PX) ce provine dintr-o selecţie speciala de 12 butoaie mari ce poarta fiecare numele unuia dintre cei 12 apostoli – in butoiul cu numele Iuda se ţine la maturat oţetul balsamic, Del Duque Amontillado, Solera 1847 Olorose Dulce, dar şi Tio Pepe, cel mai cunoscut şi mai raspandit dry fino al producatorului. Aceste vinuri fortifiate au arome uşor amarui, ce amintesc de migdale, masline şi nuci verzi, samburi de fruct pentru sherry de tip dry fino, in timp ce aromele foarte dulci de fructe uscate sau zaharisite, smochine, zahar brun şi caramel caracterizeaza sherry-ul dulce. Istoria acestui producator este impresionanta şi strans legata de istoria oraşului Jerez de la Frontera. Centrul oraşului este organizat in jurul acestei crame, multe strazi fiind umbrite vara de viţe de vie vechi de zeci de ani crescute foarte inalt, asemeni unor copaci. In fiecare an Gonzalez Byass primeşte in jur de 400.000 de turişti. Deşi par mai greu de inţeles la inceput, datorita diferitelor stiluri de producere, aceste vinuri fortifiate pot fi foarte complexe şi, avand in vedere preţurile mult subevaluate, sunt adevarate chilipiruri pentru orice amator de vinuri bune. Link direct catre articol aici. Link catre mai multe poze aici. It does seem to me that this starts to become a regular annual event. 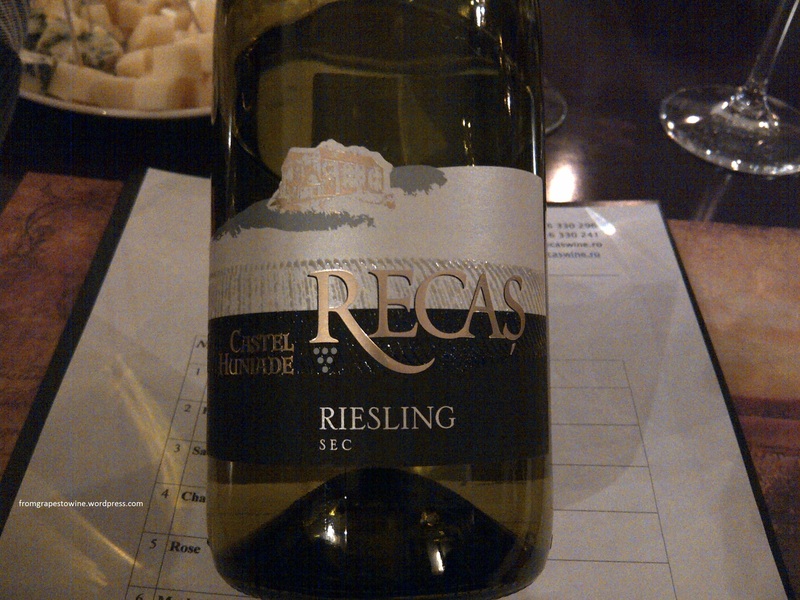 Just like about one year ago, I received an invitation to visit Recas Winery at the beginning of March. The same means of transportation: one hour by plane as they are situated 550 km NW from Bucharest, but this time the crowd invited was slightly different than in the past. If last year the guests were only people writing about wine in a professional or amateur way, this year’s group was far bigger (25 people) and far more varied. 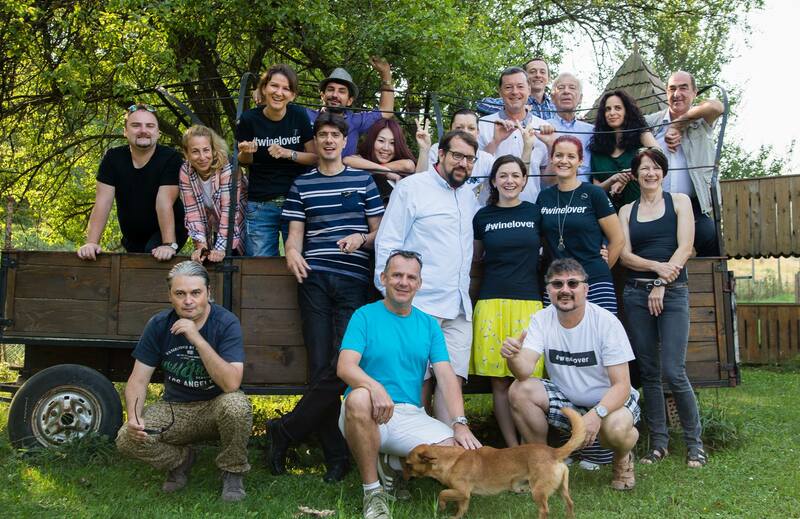 There were also journalists from financial and food publications, owners or part-owners of restaurants from Bucharest and people from marketing agencies. You could not get a more diversified group of people visiting a winery. 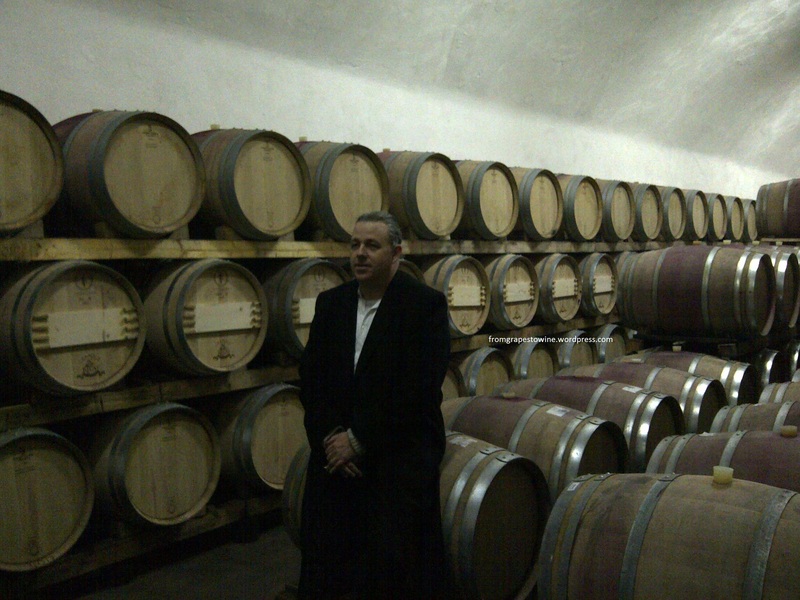 The purpose of our visit was to taste their new wines, with emphasize on the new Castel Huniade range. Castel Huniade replaces the old Castle Rock brand and it covers the range of 15-17 Ron wines. 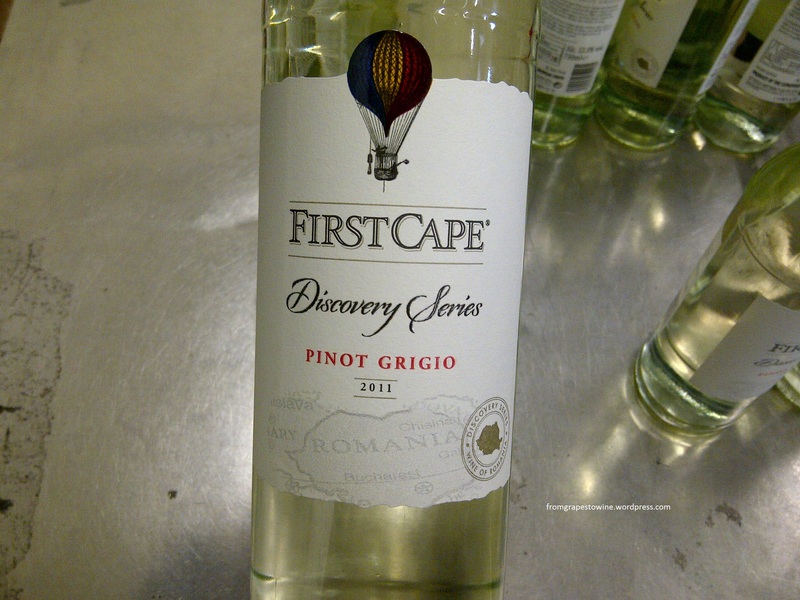 Just as the management mentioned, this seems to be the preferred range of wines for weddings and it is demanded by most of hotels, restaurants and other enterprises involved in the hospitality business. Mr Philip Cox was, just like last year, our host during the visit. 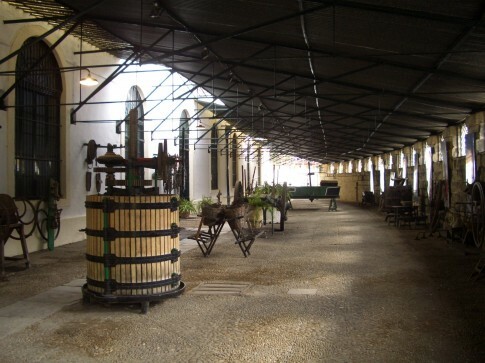 The visit started with a tour of the premises and detailed explanations about each step involved in the wine making process. 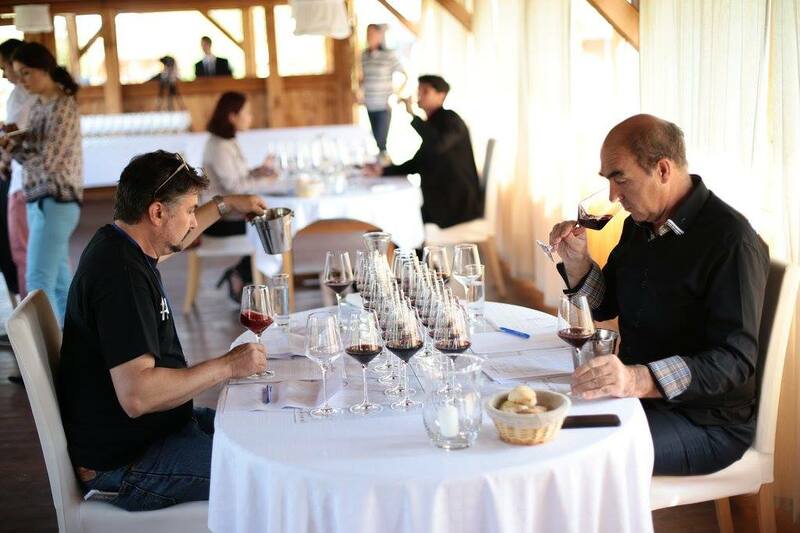 It seems that Recas winery is among one of the few very successful producers in Romania as last year they faced more demand than their actual production for some of the wines. Their premium wines: the red Cuvee Uberland and the white Solo Quinta were real blockbusters, completely sold out way before the new vintage was even harvested. Mr Cox explained that currently they produce about 12 Millions L of wine per vintage and the aim is to increase to 18 Millions by 2015. Their exports increased significantly – 130%, last year they sold about 1 Million bottles in UK through Tesco. The exports are expected to increase from 40% of the total production to 50%. The most most notable success, that Mr Cox is very proud of, was the selection of Solo Quinta 2011 by Maze – a British Michelin star restaurant belonging to Gordon Ramsay – as one of their white house wines. Mr Cox was very transparent about the company’s strategy and mentioned they are always looking in advance what are the global fashionable trends in wines and they try to go along those lines. 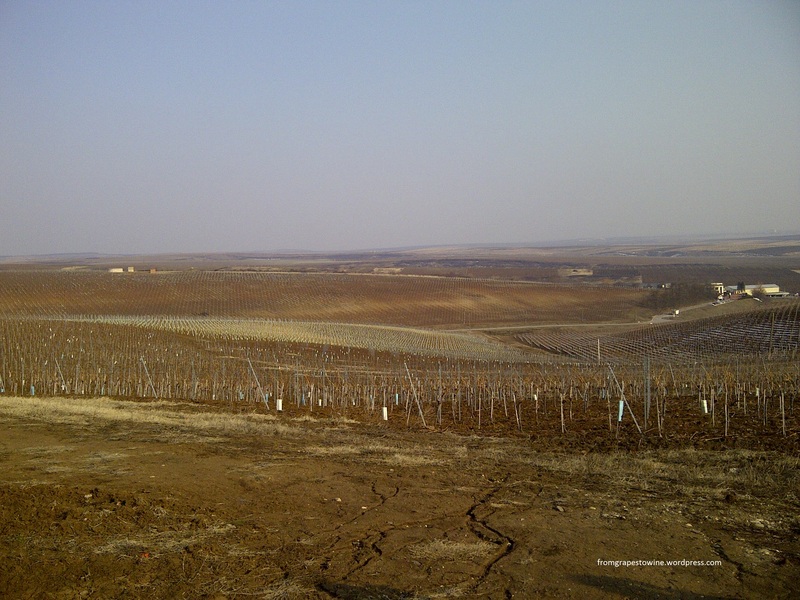 This is a fairly big winery,with around 950 ha under production, and they started to extend more with acquisitions in Minis, near Arad area. The visit was structured to start with an initial tasting of the Castel Huniade range in the morning, lunch, visit in the vineyard and then a tasting of Cocosul and Sole range, Cuvee Uberland and Solo Quinta in the afternoon. Castel Huniade range comprises of 8 wines: whites are Riesling, Feteasca Regala, Sauvignon Blanc, Chardonnay, a rose and three reds, Merlot/Feteasca Neagra, Cabernet Sauvignon and Merlot/Pinot Noir. Many of these wines are off-dry and semi-sweet which I find fatiguing to enjoy, but it does seem to appeal to a vast majority of consumers. If I were to point some favorites of this range I would choose the only dry of the reds: the Cabernet Sauvignon and the off-dry Feteasca Regala from the whites. 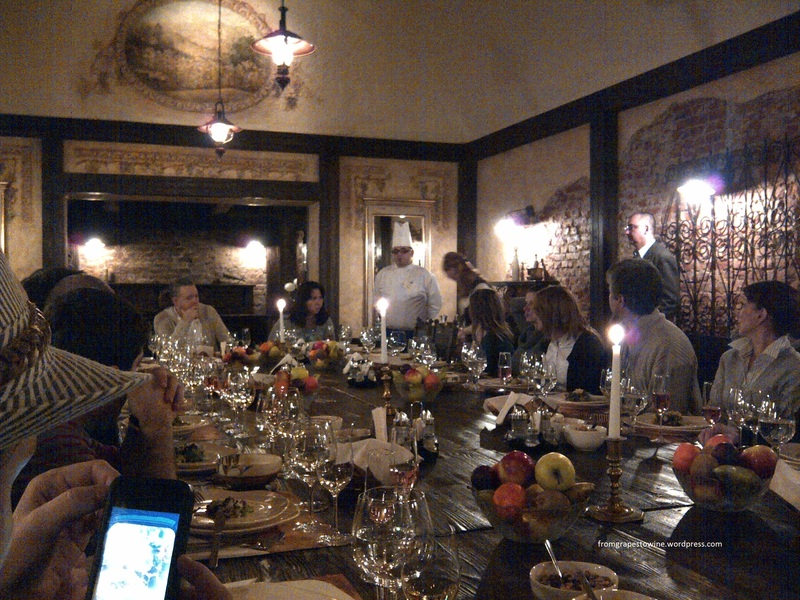 Lunch consisted of a five course menu prepared by their own chef that heads the winery’s restaurant. 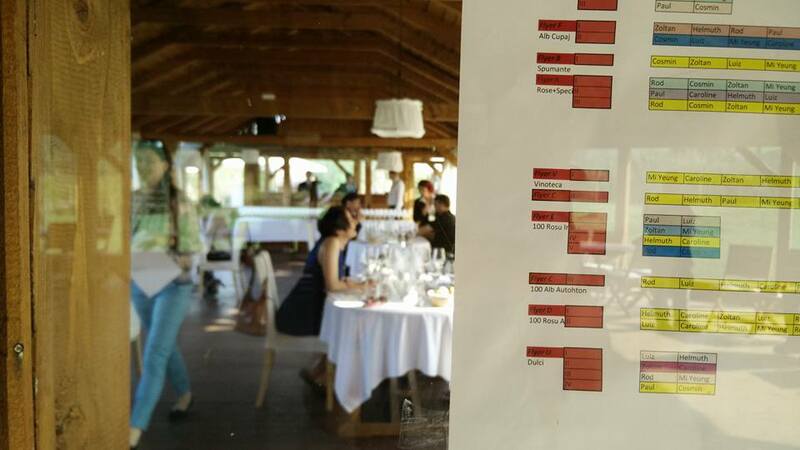 The dishes were matched with foreign wines, the winery having a significant portfolio of imports consisting of top International brands: MASI, Robert Mondavi, Piccini, Planeta, Louis Latour and many others. The menu: salmon carpaccio with salad and parmigiano / grilled shrimps with green beans soup / duck breast with Gorgonzola, nuts, quince jam, rice and baby carrots / beef steak with cheese and black truffles sauce, tagliatelle and endives / dessert: pastry with apple and vanilla sauce. 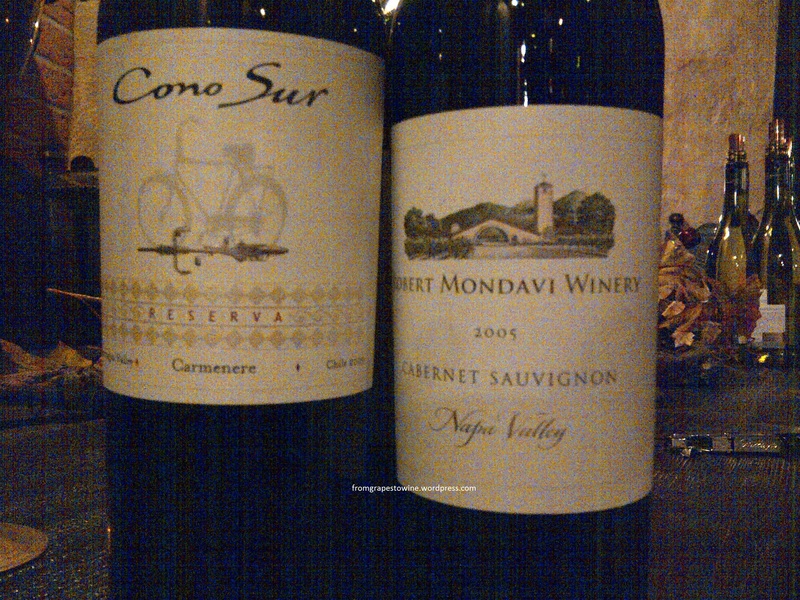 The wines served during the meal were: 2010 Nederburg Chardonnay South Africa, 2007 and 2010 Nobilo Sauvignon Blanc New Zeeland, 2009 Planeta Chardonnay, 2009 Cono Sur Carmenere Reserva, 2005 Robert Mondavi Cabernet Sauvignon Napa Valley and for dessert we had, just like the previous visit, a sweet 2005 Traminer produced from vines that are no longer existent. 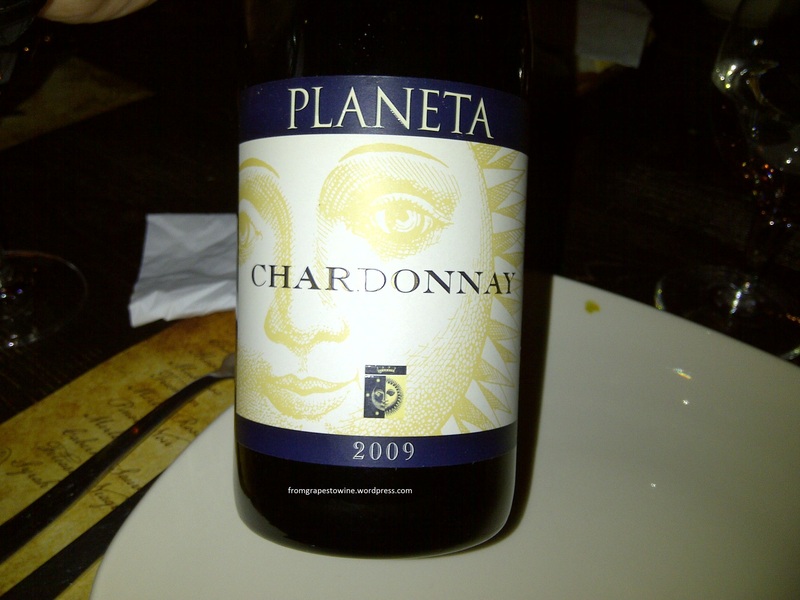 I particularly enjoyed 2009 Planeta Chardonnay: gold yellow color, expressive nose, elegant, with plenty of flavors of butter, vanilla, yellow flowers,ripe yellow fruit, honey, unctuous on the palate, an oxidative character, rich, with a long finish (91/100). After such a generous lunch, a walk into the vineyards was most welcomed. We also got the chance to take some nice pictures of the area that provides the grapes for Cuvee Uberland. The soil is rich in white clay and can be easily seen in the middle of the hill next to the winery. Back at the winery, we started the next tasting. 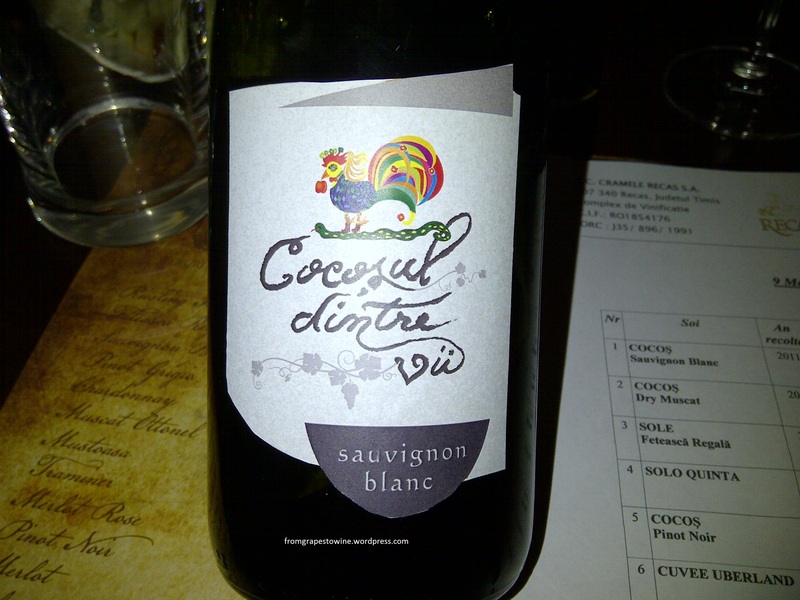 The former Cocosul brand was also re-branded and is now called Cocosul dintre vii. We tasted a Sauvignon Blanc, a Dry Muscat and a Pinot Noir from this range. I enjoyed the Dry Muscat the most. We tasted Sole Feteasca Regala and Chardonnay 2011, Solo Quinta 2011 and Cuvee Uberland 2009 and 2011. I confess liking more the 2011 Sole Chardonnay than the 2011 Solo Quinta (which contains up to 80% Chardonnay). The Sole Chardonnay comes along as a more serious wine to me, not having the Muscat like profile of Solo Quinta. 2009 Cuvee Uberland is a lot more different than last time I tasted it from barrel more than 1 year ago. Back then, it felt really big, with a body builder like profile and very ripe fruit flavors. Now, the wine seems to have lost a lot of its over-the-top muscles and metamorphosed into a more supple wine. It is however very young, it has a wide spectrum of flavors, but I find it hard to enjoy at the moment, due to a pronounced presence of its tannins on the finish. 2011 Cuvee Uberland from barrels has all the attributes of a wine situated in full transformation. The acidity is over the board, but the layers of fruit are there, the structure is in place and it seems to have a supple, but yet full body. Cuvee Uberland’s style varied a lot from its inception. The first vintage produced – 2006, was supple and marching on elegance rather than power. Then, 2007 was powerful more than anything else, closer to an Amarone, as they employed a similar technique of drying the grapes ( cut and left on the vines for 3-4 weeks). The next vintages are more of a balancing between the two different styles, using with the same technique of drying the grapes. 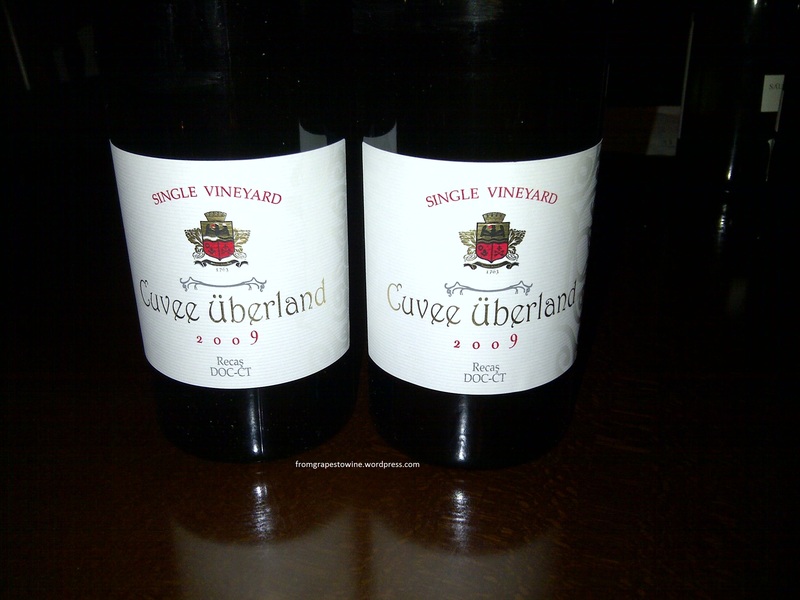 Cuvee Uberland was produced in 2006, 2007, 2008, 2009 and 2011. The 2010 vintage did not offer the right conditions to produce grapes of the quality required to make Cuvee Uberland. For more pictures from this visit please click here. Looking back at what 2011 meant for me, from a wine related perspective, I can only be grateful and cherish all those special moments I lived visiting exciting places, attending interesting wine tastings and meeting amazing people in Romania and abroad. 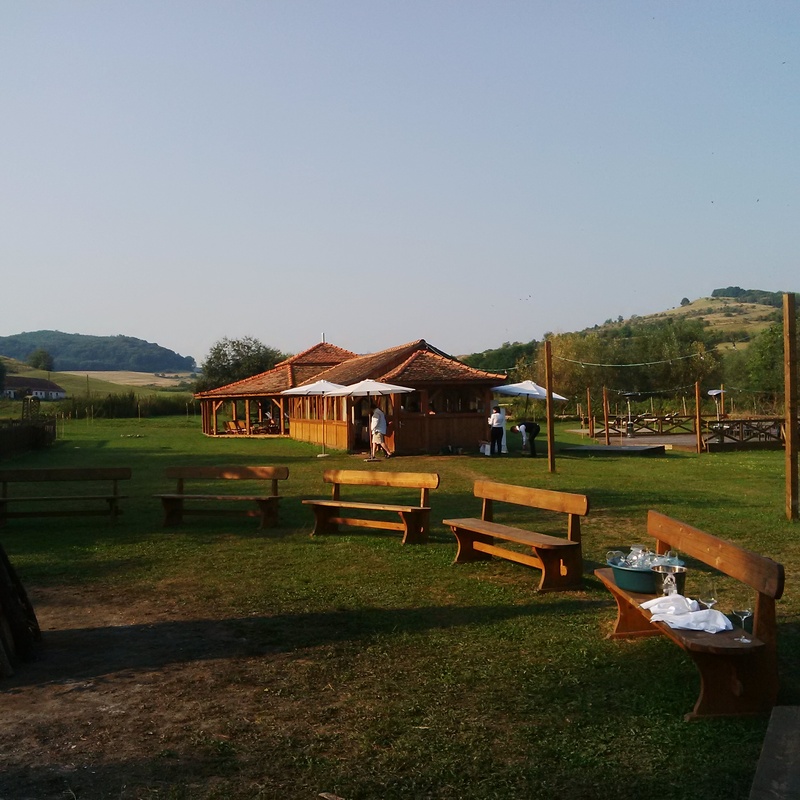 I visited 15 wineries in 4 wine regions from 2 different countries – France and Italy, plus the 7-8 visits to Romanian wineries(Lacerta’s new winery is the most exciting of all with its modern design). 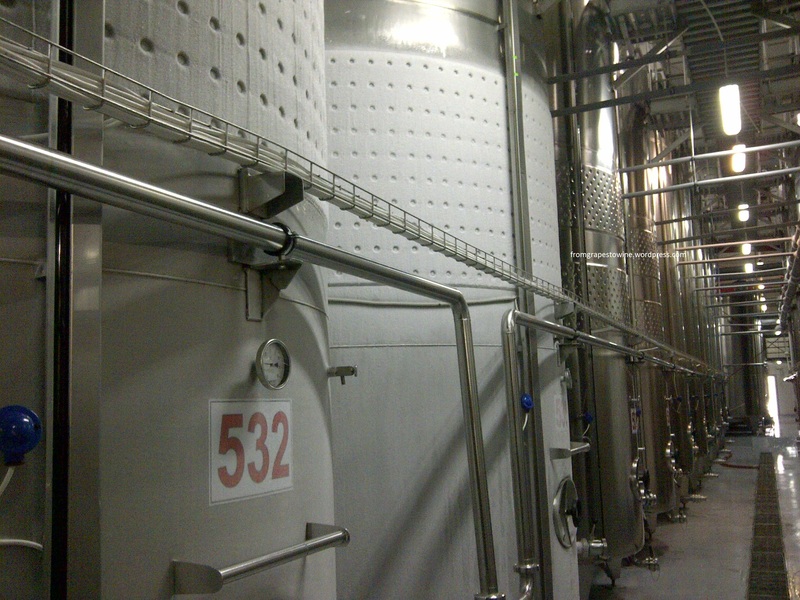 I am looking forward to visit Avincis in 2012, as they also built a state of the art winery. The wine trips started in April with a visit and a dinner at Masi in Veneto, then immediately followed by a weekend spent in Champagne where I could only visit Moet Chandon’s cellars, but also the small Grand and Premier Cru producing villages; in June I managed to visit 9 prestigious producers in Bordeaux – with emphasize on Petrus and the stunning lunch at Cheval Blanc, the others were: Ducru Beaucaillou, Figeac, Leoville Poyferre, Gloria, St-Pierre, Pontet Canet and Cos d’Estournel; in September I was impressed by the gorgeous landscape of Barolo while visiting Luciano Sandrone, Cavallotto and G.D. Vajra, and Braida in Asti area. I attended two International wine fairs: Vinitaly in Italy in April and Vinexpo in Bordeaux in June that completely changed my perspective of what a wine fair experience should be and, sadly, also made me realize how far away we are from having a similar situation in Romania at this moment. 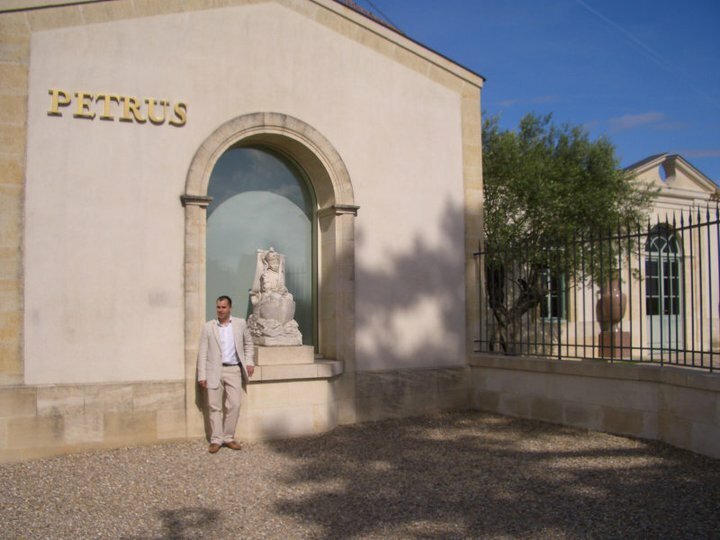 I visited the impressive cellars of two negociants: one in Bordeaux with over 4 Million bottles that is just like a Bank dealing with a different currency, sometimes more valuable, and one in Belgium that works strictly with rare and old vintages of both Burgundy and Bordeaux. It is always exciting for a wine geek to see piles of cases of the most sought after wines – Petrus, Romanee Conti or 100+ years old Yquem in one single place. I attended several Wine-dinners in Bucharest with older vintages of Bordeaux and Spanish wines and, in December, I actually organized such an event myself. Always nice to meet new people having the same passion and I am certainly looking forward to repeat this experience in 2012 as often as possible. I had a few articles published in the Romanian wine magazine Vinul.ro about my wine trips (here and here) and the investment in wine, the monthly wine recommendations, and also an interview structured as the portrait of a wine collector published by the Good Food magazine. 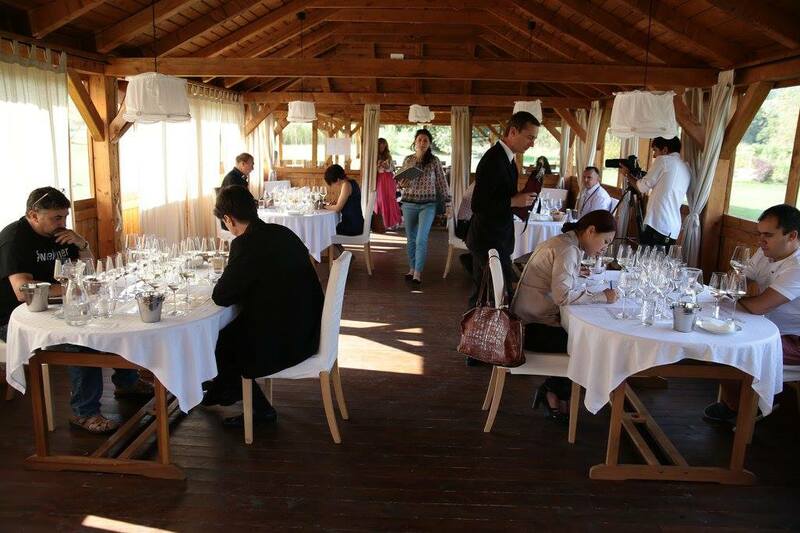 The number of wine events organized in Bucharest increased exponentially compared to 2010, ranging from launching of new local and imported wines, new wineries and verticals of several years organized by the very few producers that can do that. However, the most distinguished of all was the event organized by Le Manoir, where major International wineries had representatives showcasing their wines during dedicated seminars. It was a first to see La Spinetta, Ch Canon and Rauzan Segla, all Joseph Drouhin’s range of wines, Michel Rolland collection presented by his son in law, Michel Redde, Ch Laubade and some similar producers present in one single room in Bucharest. A similar event was organized later by the importer of Banfi wines, but at a much smaller scale. While writing this article, I made an attempt to establish a top of the wines I had during this year, but it was impossible to do it. There were so many outstanding wines that it would take too much time to even try to make it. I started to enjoy more and more older vintages and I made a new year resolution to drink wines that are at least 4-5 years old. Ideally, starting from their 6-8th year from the vintage. 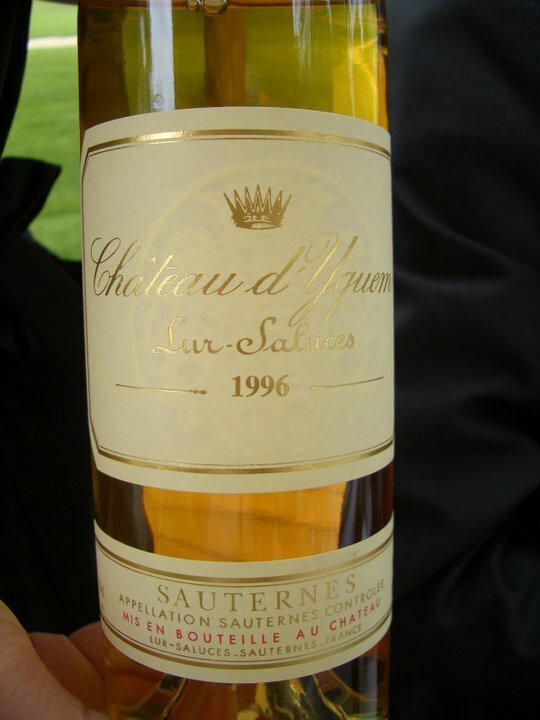 There is however one wine that I particularly enjoyed while having lunch at Cheval Blanc: the 1996 Chateau d’Yquem that, so far, is the best sweet wine I had. I am just glad that this year I had wines from 1966, 1969, 1970, 1975, 1985, 1986, 1989, 1990 and a few more recent vintages. I can just hope that next year brings at least similar experiences. To finish on the same note as the beginning of this article, I am grateful for all these experiences shared with special people and all those amazing wines I had. Happy New Year and all the best to you dear Reader !